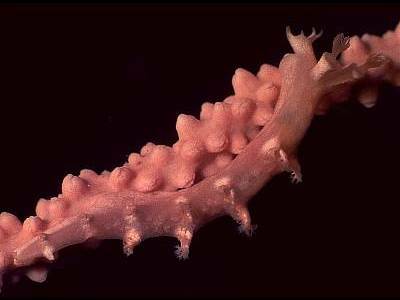 MOLLUSCA : NUDIBRANCHIA : Tritoniidae SNAILS, SLUGS, ETC. Description: This animal is usually pale salmon-pink or pure white and may grow to up to 34mm. The head bears six oral processes. There are approximately eight pairs of gills on the dorsum, that closely resemble the feeding polyps of the sea-fan Eunicella verrucosa. The rhinophores are similar to other Tritonia species, with smooth edged sheaths and branched tips. Habitat: T. nilsodhneri is extremely well camouflaged on its prey, the gorgonian coral Eunicella verrucosa. It is only on close inspection of the sea-fan that the nudibranchs may be found. 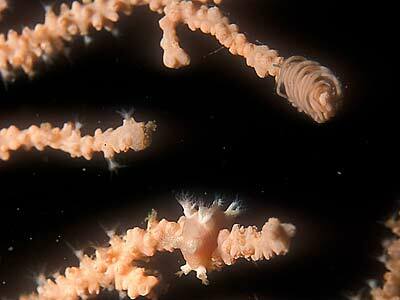 The spawn consists of a fine string of eggs coiled around the stem of the gorgonian. Distribution: A south-western distribution in the British Isles; the northern limit of this animal's distribution appears to be St. John's Point, Co Donegal, (NW Ireland). It is known to occur as far south as northern Spain, where it feeds on other sea-fans and is white with a grey hue over the back. Six processes on the oral veil. Picton, B.E. & Morrow, C.C. (2016). Tritonia nilsodhneri (Marcus, 1983). [In] Encyclopedia of Marine Life of Britain and Ireland.